These paleo chocolate cookies meet the technical criteria to be considered “paleo” but let’s not fool ourselves into thinking they are healthy! 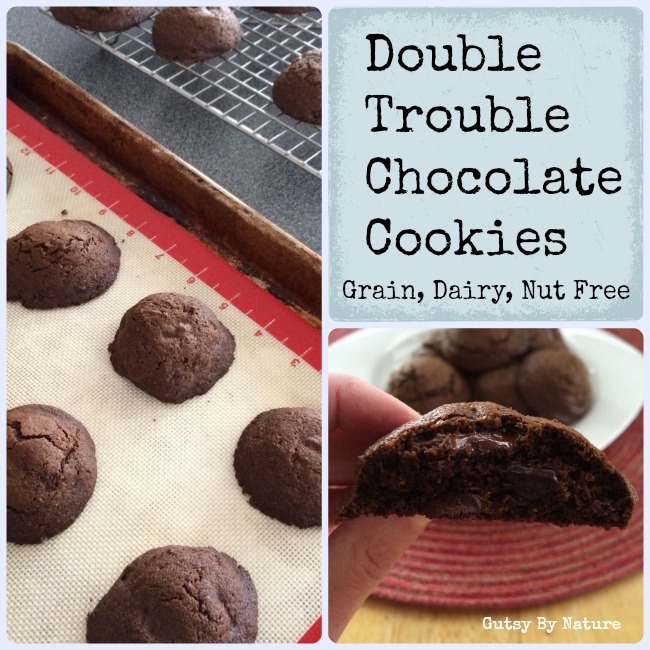 They are grain free and dairy free, but they are definitely treats and should be eaten in moderation. Key phrase there: should be. I had every intention of spreading my consumption of these out over a week or so and put them away in the freezer shortly after cooling, thinking that would slow me down. Turns out they are just as tasty frozen, so that didn’t work. 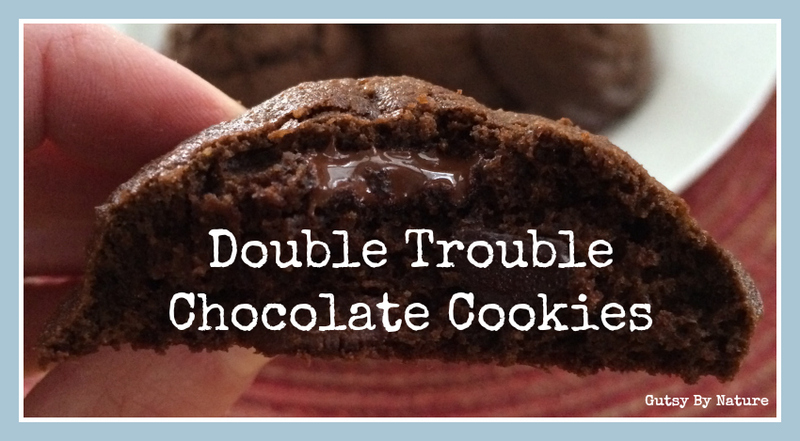 I decided to call these cookies “double trouble chocolate cookies” because they are double-y addictive and that could spell trouble if you don’t have someone to share them with! I actually gave up chocolate for about 8 months, first because it is forbidden on SCD and then as part of the paleo autoimmune protocol. When it came time to start reintroducing foods, chocolate was one of the first things I tried and I was thrilled to get it back into my diet. I can attest that life without chocolate is tolerable, but life with chocolate is much nicer! These cookies use a combination of tapioca starch and coconut flour, which gives it a crisp exterior that cools to a softer texture. My chief quality control officer declared them to have a good flavor but was not impressed with the texture. Personal preference, I guess, because I thought they were fantastic (see above comment about their addictiveness…). To keep them dairy free, I used sustainably harvested non-hydrogenated palm shortening (I trust this brand). If you tolerate dairy, then grass fed butter would probably work very well here. Make sure the chocolate chips you use are dairy free and preferably also soy free. This is the brand I use, but if you can’t find them you can chop up a bar of dark chocolate (or you can omit the chips entirely, but then they’ll just be “trouble chocolate cookies” rather than “double trouble chocolate cookies”). Delicious paleo chocolate chocolate chip cookies that are grain free, dairy free, and nut free. Preheat oven to 375 degrees and line a baking sheet with parchment paper or a silicone baking mat. With an electric mixture, beat shortening and sugar together until fluffy. Add eggs, beating until combined and fluffy. In a separate bowl whisk the salt, flours, cocoa powder, and baking soda together, making sure there are no lumps. Turn the mixer to low and slowly add the dry ingredients until combined. Drop by rounded tablespoon about 2 inches apart. HINT: If you want a flat, traditional looking cookie, press them down slightly before baking. They do not spread very much in the oven. Bake for 12-15 minutes. Cool on cookie sheet for a few minutes and then remove to a wire rack to cool completely. Shared on Fat Tuesday, Allergy Free Wednesday, Gluten Free Friday.